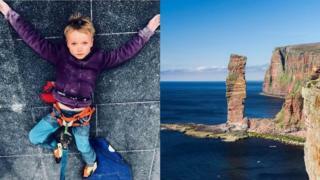 An eight-year old boy from Caithness in the Highlands has become the youngest person to clambered the Old person of Hoy sea stack off the coast of Orkney. Edward Mills, who live in Dunnet, determined himself the challenge to raise money for the benevolence Climbers Against Cancer. His mum, Bekki Christian, has terminal breast cancer. Edward described the tour to the top of the 450 ft( 140 m) line of stone as “quite scary”. He told BBC Scotland his mum had taken a ferry to realize him during the course of its clamber, which then resonated its horn when he reached the peak. He described learning a container and tiny book at the end of his climb. He said: “There was a hidden box up on the top and I had a metal card which said ‘Mum’s gift to Climbers Against Cancer’, which I put into the box and I wrote a story in the book. 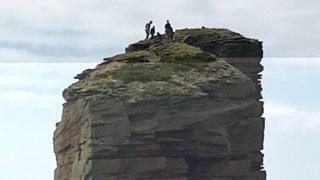 “I said I clambered this sea stack for my mum and I caused fund for Climbers Against Cancer. Edward said he started climbing when he was about 2 years old. He said his mum Bekki was very proud of him. He ended the rising on Friday afternoon, with his coach-and-fours Ben West and Cailean Harker. The record was previously held by 10 -year-old Ollie Buckle, from Flax Bourton, near Bristol . Prior to that, renowned British climber Leo Houlding scaled the landmark when he was 11. Edward and his squad began their clamber at midday and reached the surface at 16:55. His JustGiving page called, Edward vs The Old Man of Hoy, has had donations totalling more than PS11, 000. His dad Nathan Mills posted an update on the page which said: “He did it. He is absolutely delighted. 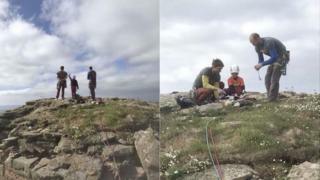 The eight-year-old realized it of the working group finals of the British Mountaineering Council’s Youth Climbing Series last year – the first time he had entered. 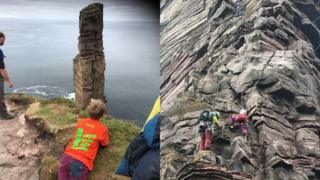 This year he earned a place on the Scotland youth clambering squad. His family said Orkney was a special place for them, having holidayed there many times. On the fundraising page, his father said he hoped Edward, and his older brother George’s, enjoy of clambering, and the “amazing community” they had become part of through the sport, would help them deal with the “incredibly difficult time” they were facing as a result of their mum’s cancer.